Vasu is Vishnu. 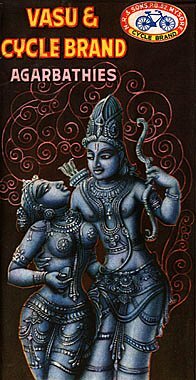 But the picture looks liks Rama and Sita. Ofcourse Rama is an incarnation of Vishnu anyway so they probably dont care if they mix up certain features of one incarnation with the other. Agarbathies are incence sticks.